Housekeepers will strike on International women’s day on March 8.The strike will start at 10:00 in the morning of March 8th 2019 and will finish at 23:59 on the same day. Staff should stop working at 10:00 and go to Gamla bíó to participate in the program and register for payment from the strike fund for the day. The payment will be 12.000 kr. minus tax and will processed at the end of the month. In Gamla bíó there will be a program all day from 10:00 to 18:30 for strikers and and their supporters. 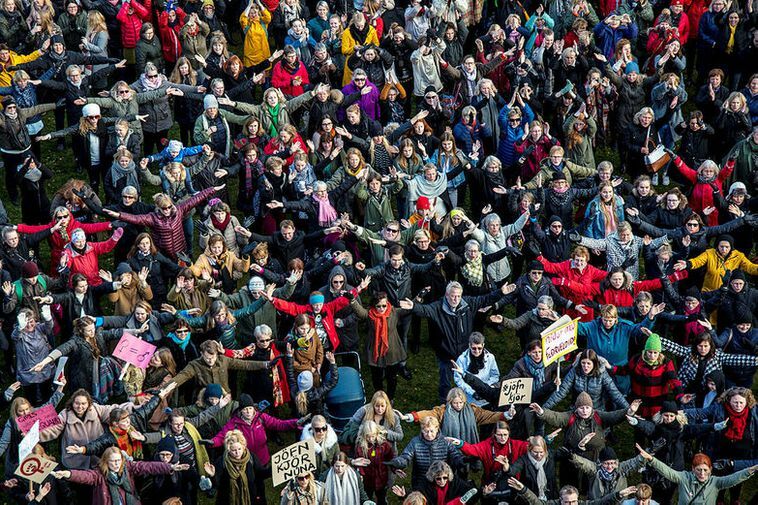 Strikers and their supporters are urged to take part in a march at 16:00 going from Gamla bíó and passing all the largest hotels in downtown Reykjavík. The march will end up back in Gamla bíó at 17:00 where Drífa Snædal chairman of ASÍ (Icelandic confederation of labour) will chair a solidarity meeting organised by MFÍK (Women’s Culture and Peace Organisation of Iceland). Among speakers are Sanna Magdalena Mörtudóttir, NIchole Leigh Mosty, Magga Stína Blöndal and Arna Jakobína Björnsdóttir. Music is in the hands of Spaðabani, Guðlaug Fríða og Kvennakór Impra. If you cannot make it to apply for strike fund payment at Gamla Bíó on Friday you can come to the Efling office on Monday and Tuesday 11-12th March during opening hours to fill in your application. The housekeeping work stoppage applies to cleaning, housekeeping and laundry services for rooms and other sleeping accommodation and connected areas and services, for example in corridors, toilets and shared spaces, in all hotels and guesthouses in the area which Efling has jurisdiction over, which includes the areas of Reykjavík, Kópavogur, Seltjarnarnes, Mosfellsbær, Kjós, Grímsnes og Grafningshreppur, Hveragerði, Ölfus County, and additionally Hafnarfjörður and Garðabær.